WORMS gross many people out, but the children at Hilton Primary School are using the common garden wrigglers to help them learn more about sustainability. 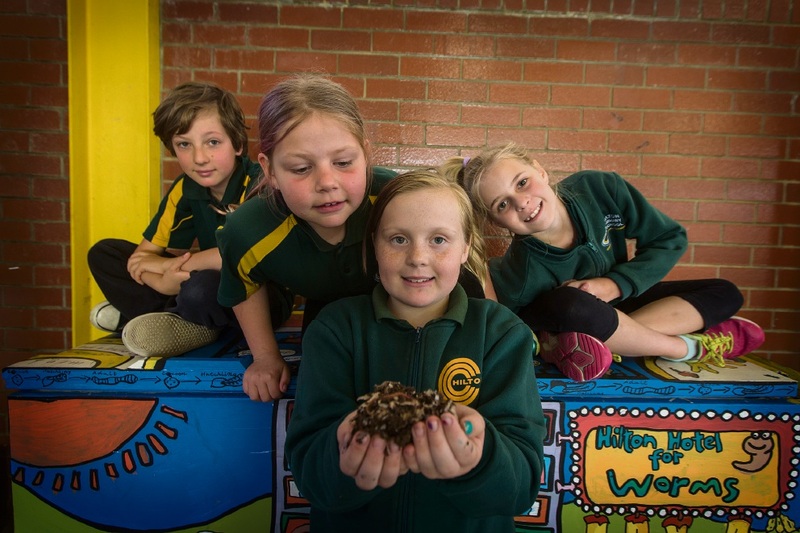 The school has created the Worm Warriors, a group of students tasked with maintaining a handmade worm hotel, one of many ways the children are working hard to live as sustainably as possible. Other school-led projects include promoting sustainable food consumption, such as a waste-free lunch strategy, and membership to the CSIRO’s Sustainable Futures Program. Hilton Primary teacher Andrea Townes said one of their biggest focuses recently has been reducing food waste. “Research has revealed that in Australia, young Australians aged 18-24 are the worst culprits so we think it’s important to educate the next generation to hopefully break this cycle,” she said. “By teaching the children ways to reduce their food waste, we hope they’ll not only carry these positive habits into adulthood but also pass them on to their parents at home. “We hope that the Sustainable Futures Program and its activities around food will teach children to be more mindful about their food; where it comes from, its impact on the environment and ways to reduce waste.